If you’re like most basketball coaches, you’re searching for size to bolster the interior of your team, getting points in the paint and grabbing rebounds! However, the traditional post player as we once knew it has slowly become a thing of the past. More and more programs are utilizing the 4 around 1 alignment, trading size for more speed and quickness instead. The trend in basketball nowadays has been to go small and have at least four players on the floor that can handle the ball and potentially be a shooting threat from behind the arc. Here is a set play ripped directly from the ‘Dribble Drive Offense’ that has proven to help many coaches with a similar roster makeup. 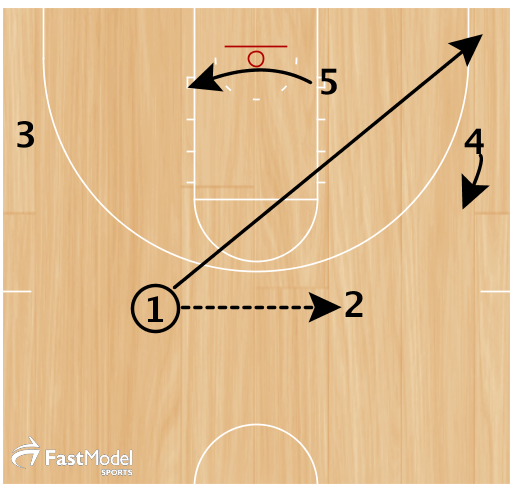 The beauty of this set play is that you can also use it as your secondary break! It allows for your 5-man to hide on the offensive end of the floor if he/she isn’t good at scoring, especially with the back to the basket. However, it does put him/her in a scoring position. At the same time, it allows your perimeter players to be spaced for penetration and 3-pt. shots. This link shows you the entire play/secondary break: http://www.fastmodelsports.com/library/basketball/fastdraw/1969/play–Fire–Dribble-Drive-Set-or-Secondary-.